Time-resolved photoion and photoelectron velocity mapped images from NO2 excited close to its first dissociation limit [to NO(X2P) + O(3P2)] have been recorded in a two colour pump–probe experiment, using the frequency-doubled and frequency-tripled output of a regeneratively amplified titanium–sapphire laser. At least three processes are responsible for the observed transient signals; a negative pump–probe signal (corresponding to a 266 nm pump), a very shortlived transient close to the cross-correlation of the pump and probe pulses but on the 400 nm pump side, and a longer-lived positive pump–probe signal that exhibits a signature of wavepacket motion (oscillations). 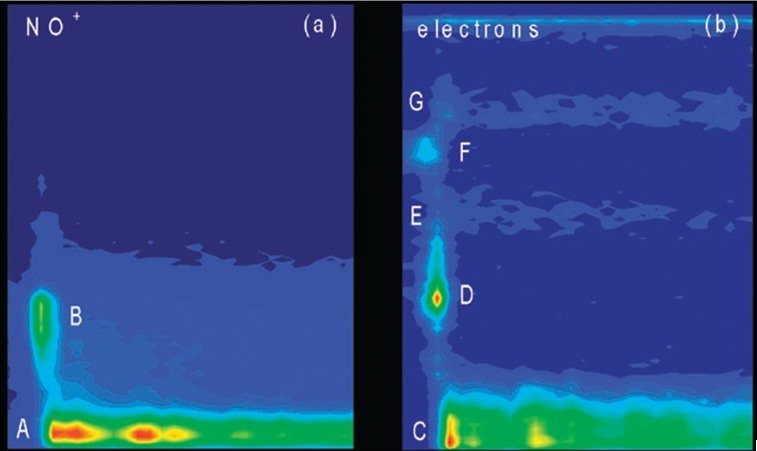 These transients have two main origins; multiphoton excitation of the Rydberg states of NO2 by both 266 and 400 nm light, and electronic relaxation in the 12B2 state of NO2, which leads to a quasi-dissociated NO2 high in the 12A1 electronic ground state and just below the dissociation threshold. a function of the delay between the 400 and 266 nm laser pulses. The wavepacket motion that we observe is ascribed to states exhibiting free rotation of the O atom about the NO moiety. These states, which are common for loosely bound systems such as a van der Waals complex but unusual for a chemically-bound molecule, have previously been observed in the frequency domain by optical double resonance spectroscopy but never before in the time domain.